The Nostalgia Hotel may be the best option for the purpose to make sure that your stay is a pleasant and fruitful one near the coastal area of Kyrenia. This is situated near the traditional stone that is newly restored on the walled Cypriot house in the old quarter of Kyrenia. The strikingly expressive harbor and Venetian castle are present at a short distance from the Nostalgia Hotel. It as an ideal place to spend your holiday because the narrow authentic streets of the district are absolutely free from the traffic of day to day life and their irritating noise and pollution. You will be pleased to hear traditional sound of the prayer from the religious places nearby. This district of the state has distinguishing characters and its history rolls back to the times of Ottoman. This brings you the charm of the 'older days' that will leave you with an experience of the distinguishing atmosphere of the region. 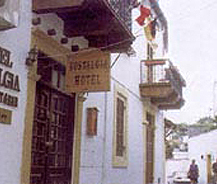 The Cypriot styles of the rooms are found in the Nostalgia Hotel are eighteen in number that appear typically Turkish which are pleasing. All the rooms of the hotel are furnished with double or twin beds, telephones lines, televisions and cooling and split unit heating systems.